Perhaps you have a ring that no longer fits you or a bracelet that is not in fashion any more, or you have simply outgrown it. Perhaps you have inherited something or it is a valuable piece that is associated with unpleasant memories. It may be a huge chunky piece or a delicate one, a watch or a clock. As long as it is ‘real’ and has value, you should be able to sell it for a good price. Whether there are precious stones and gems, silver or gold, watches or coins, there are always jewelry buyers on the lookout for good pieces. Considering that the price of gold, silver, diamonds and other precious stones is always on the rise, you stand to get a good chunk of change for your jewelry. In fact, while gold and other precious metals are a hedge against inflation, these also offer easy liquidity when you need money. How do you go about selling these valuables? 3) whether it is genuine or not. Sometimes, it is a good idea to break down the components of your piece and sell them separately because this way you will know that the jewelry buyer will be giving you a fair price for your precious ornaments. You will, of course, lose out on the making charges when you do this. But if you have unusual pieces or jewelry which may have antique value, you may be better off trying to find a jewelry buyer who will pay you a better price than the value of the metals/stones in your piece. Antique value or a designer label may actually add to the price of the piece. Here, you will have to find a genuine buyer or go to a pawn shop or even an auction place to get an appraisal and actually sell your jewelry. Sometimes jewelry buyers look for pre-owned jewelry. In fact, once pieces are polished and repaired if required, nobody will be able to tell that they are not brand new, so jewelry buyers can actually buy good ornaments at reasonable prices. 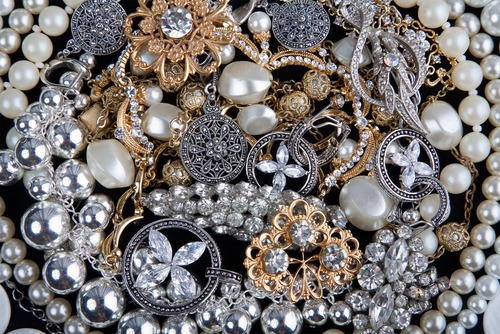 Whether you have one piece or many, it is always a better idea to find out an approximation of the price you can hope to get and then dispose of the jewelry to whoever pays you a good price.